The Internal Revenue Service and the Securities and Exchange Commission are still reviewing allegations that Vanguard Group Inc.’s unusual business structure operates in violation of federal tax law, according to attorneys for former Vanguard tax lawyer David Danon, who brought the allegations to the agencies’ attention in 2013. 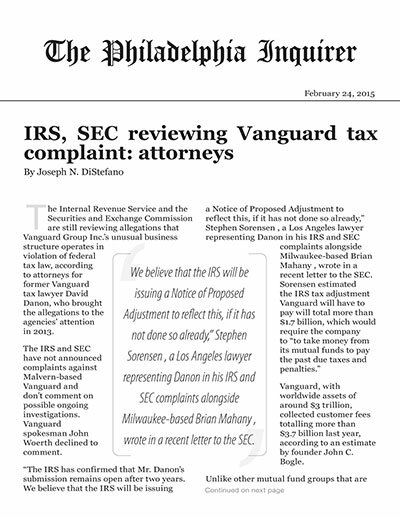 The IRS and SEC have not announced complaints against Malvern-based Vanguard and don’t comment on possible ongoing investigations. Vanguard spokesman John Woerth declined to comment. Vanguard, with worldwide assets of around $3 trillion, collected customer fees totalling more than $3.7 billion last year, according to an estimate by founder John C. Bogle. Unlike other mutual fund groups that are owned by investors, Vanguard Group is a private company owned by its funds and managed by top executives. The company says this helps ensure it acts in fund shareholders’ best interest. Danon says he, as a Vanguard tax attorney starting in 2008, had concluded by 2012 that the group had underpaid federal and state income taxes by more than $1 billion, by undercharging its own mutual funds for management services, ensuring it operates on a nearly break-even basis and pays little income tax. Danon says that violates tax-code requirements that related companies (such as Vanguard Group and its funds) must pay market-level prices for services, at rates above what Vanguard actually pays, and pay tax on the resulting profits. Danon also says Vanguard set aside a $1.5 billion “contingency fund” that wasn’t taxed or shared with shareholders. Why mess with low costs and low fees? Danon says Vanguard’s low payments violate Section 482 of the Internal Revenue Code, which requires companies to charge affiliates they buy services from the same market prices they would pay to outside companies, to ensure they aren’t using sham transactions to artificially depress their tax obligations. According to court filings, Danon says he complained to his boss that he couldn’t endorse Vanguard’s tax practices. He says he was told in January 2013 he would be terminated by June. That January, Danon alerted the IRS to his tax allegations. In May 2013, he also reached out to the SEC. He alleged to the SEC that Vanguard was failing to alert fund shareholders about its potential tax liability, and not crediting fund shareholders with their share of the contingency fund. When the IRS finds complaints have no merit, “generally, you get in a year or two a cryptic letter from the IRS that they are not taking action,” said Brian Mahany, a whistleblowers’ attorney who is co-counsel with Sorensen in the IRS and SEC complaints. Active IRS investigations can take several years, Mahany adds. Danon also filed a whistleblower complaint in New York State, where he says Vanguard also avoided taxes. Danon hopes to be awarded a share of back taxes or penalties. Bloomberg reported last year that Sherri Hunt, a Citigroup whistleblower represented by Mahany, collected $31 million after suing her former employer in a mortgage fraud lawsuit that resulted in a $158 million settlement with the government. At a Feb. 13 hearing before New York Superior Court Judge Joan Madden, lawyer Heidi Wendel, representing Vanguard, said, “We have very strong arguments that show Mr. Danon is completely wrong” about Vanguard tax frauds. Before having to air those arguments, Vanguard wants Danon’s state case thrown out, alleging he violated attorney-client privilege and confidentiality rules by suing his former employer. Asks Sorensen, “Why wouldn’t Vanguard simply say — both to the judge and to the public — that it is not currently under audit” by the IRS, as a result of Danon’s allegations?. If Vanguard could say the IRS approves of its tax structure, “it would be game over” for Danon’s complaint. He suggested Vanguard might restructure itself to be more like TIAA-CREF, the college retirement plan, and replace Vanguard Group’s private, insider-controlled corporate structure with a nonprofit organization that could price its management services in much the same way TIAA charges CREF funds for similar services. According to Consumer Reports, some popular TIAA-CREF funds charge lower fees than for-profit mutual funds, but higher fees than Vanguard.